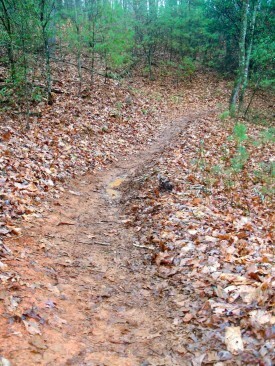 Land owners and managers may provide the financial support for mountain bike trail maintenance. However, volunteers, including cyclists who use the trails, do the bulk of the maintenance. Local organizations may also volunteer for regular maintenance work. While you’re using bike trails in your area, you can also do your part to help maintain the trails. One tip is to carry a foldable pruning saw with you, especially in the early spring, to cut back limbs that have grown out into your path. Also, be sure to let the land owners and managers know when you see trail damage from erosion, weather or vandals. Check with the landowners or managers to make sure that you are allowed to trim plants and/or perform maintenance on the trail. Some areas require a permit and have a thorough trail management process. Wear “work gloves” instead of expensive riding gloves. Plan to endure more insect bites and stings than on a no-stop ride. Bring a few band-aids or other first-aid supplies if working with saws or larger tools. Keep tools and brush out of the trail in case folks ride through. When cutting trees and larger debris from the trail, make sure to review some tool safety tips. When trimming in the heat you will want to bring an extra water bottle in your tool bag. 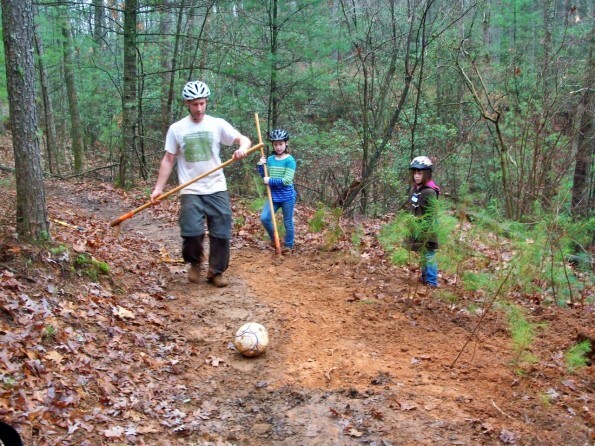 Afterward, tell your friends about your favorite part of trail maintenance. More weekly trimming riders are better for everyone. Trails can be designed and built to be sustainable. 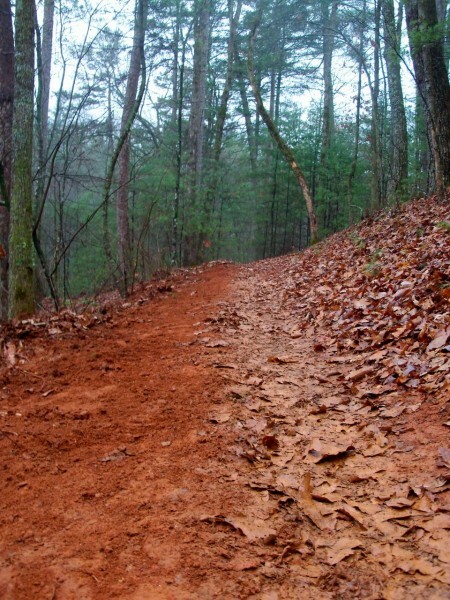 Sustainable trails have lower maintenance requirements and limited environmental impacts. In a 2006 presentation at the IMBA Summit/World Mountain Bike Conference, speakers outlined ways to meet these goals when building sustainable contour trails. Existing trails can be improved, too, by rerouting to a new sustainable trail and allowing vegetation to reclaim an old trail bed. The basic design premise behind a bench-cut singletrack trail is that you want the water to flow off the trail/across the trail instead of following the trail down the mountain. There are various techniques you can use to make this happen, but the most important is to make sure that the trail is out-sloped. Due to heavy use (or a haphazard initial build), the center of this trail tends to pack down more than the outside, creating an outer berm that holds the water on the trail. The main job was to de-berm the worst sections of the trail and to “nick” the low points by building drainage channels off of the side so that the lowest spots at the bottom and tops of the hills can drain properly. The tools of choice for this work are a pulaski and a McLeod. The pulaski is used for the main grunt work of chipping down the hardened outer berm and digging the nick in. But a pulaski isn’t capable of finishing the job. After the main digging is done, the McLeod comes out and is used to pull all the loosened dirt and other debris downhill, away from the trail. Generally, after pulling the loosened dirt away we’ll notice that the outer berm is still somewhat present, and then it’s back to the pulaski. It can take a lot of switching back and forth between tools or people and a lot of time to satisfactorily de-berm and nick a low spot in the trail. 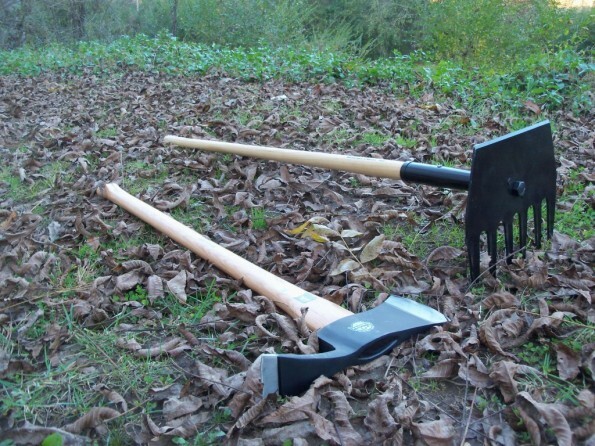 Of course, you can do a quick once over… but if you don’t put in adequate time to do the job properly, it will either not make any difference at all, or the small drainages that you’ve made will fill right up in a few months. The best plan: do it right the first time so you won’t have to be back for another decade or so! Note: the low spot pictured above was rather minor compared to some of the muck holes we tackled that day! The final test to determine whether or not the de-berming or nick will succeed at diverting the water off the trail requires a very specialized tool: a soccer ball. Yes, a soccer ball. The ball is rolled down the trail and supposedly simulates the action of water with relative accuracy. 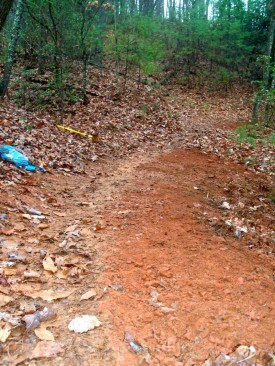 If the ball rolls off the trail at your newly constructed nick or newly removed berm, then good: mission accomplished! If not, it’s back to the pulaski until it does. Dave Muse from singletracks testing the trail with the soccer ball. With these trail design philosophies, tools, and techniques at your disposal, you are ready to start giving your trails the TLC they deserve! Before you head out and start moving dirt, though, make sure you have permission to perform the maintenance, and make sure you are working in line with the general philosophy of the trail system. For instance, out there in the National Forest, Singletracks fellows were not allowed to just go out and put tools to trail old day we please. We have to arrange pre-scheduled work days, document all the hours we work, sign waivers, and follow quirky safety procedures such as wearing helmets while we dig. So that’s it. With just a few minutes taken out of your ride each week, and a few extra grams of tools in your bag, you can be helpful to the larger trail communities in your area. If you find yourself thinking, “I am so slammed that I can’t even afford 5-10 minutes in my ride to trim some plants,” not to worry. There are plenty of us who can. 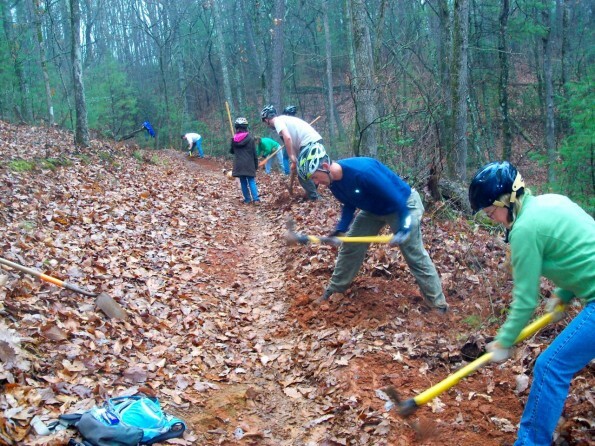 Your turn: Are you involved in maintaining your local mountain bike trails?